This is SIRIUS. He was in the K9 unit for the NYPD as a bomb detector dog. He lost his life on 9-11 when the WTC tower fell while he was doing his job. My Memorial Bracelet is for him. I wear it all the time and tell others about him. 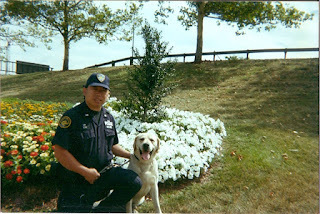 I have always loved dogs and raised and trained puppies for the GUIDE DOG FOUNDATION out of Smithtown NY. I think all that lost their life should not be forgotten, even the 4 legged ones.